One Girl And Her Dad's Obsession With The Silver And Black Sweep A Nation. Lianna Diesman and her dad, “Smiley,” are what you could call fanatical about their favorite football team, the Oakland Raiders. Being proud members of “Raider Nation” is what they live for, and with dad being a season ticket holder, it only makes sense that his little girl would follow suit. But Lianna and her dad took this love to an entirely different level when they decided to build a bike in tribute of their beloved team. 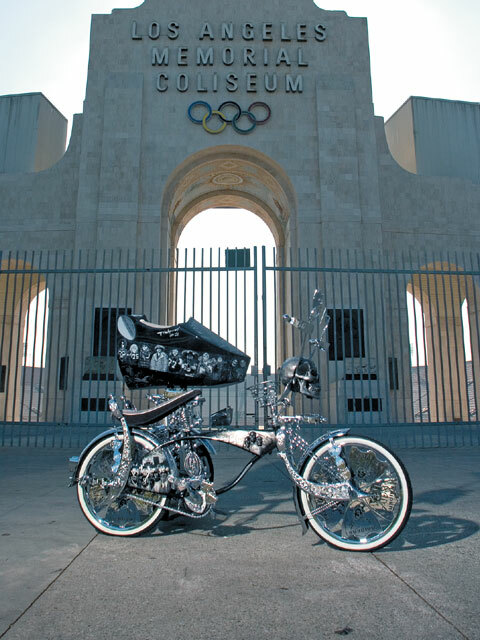 They started off with a 20-inch Schwinn frame and built it into a rolling shrine to Raider greats past and present. The handlebars and forks are fully engraved swords and were custom fabbed by Manny Jr. at Manny’s Bike Shop in Compton, California. 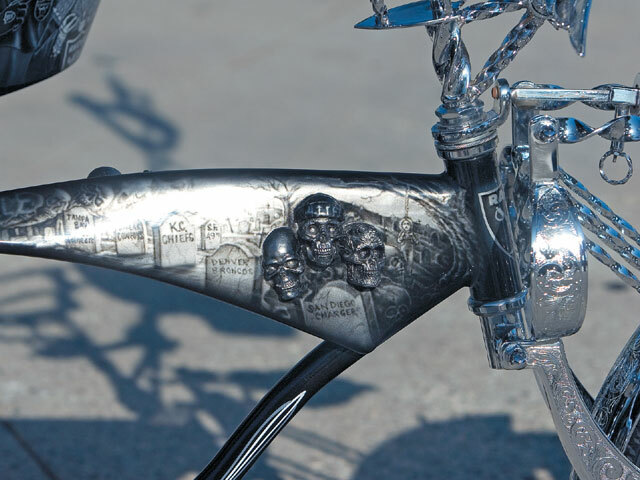 A three-dimensional skull was used to cover the neck of the handlebars and Carlos Salas of Salas Engraving did the engraving on the bike. On the backside of he skull resides a small TV for watching the game anywhere anytime. Another set of skulls resides on the right side of the frame and artist Jesse Mata of South Gate, California, painted the murals that bring the bike to life. 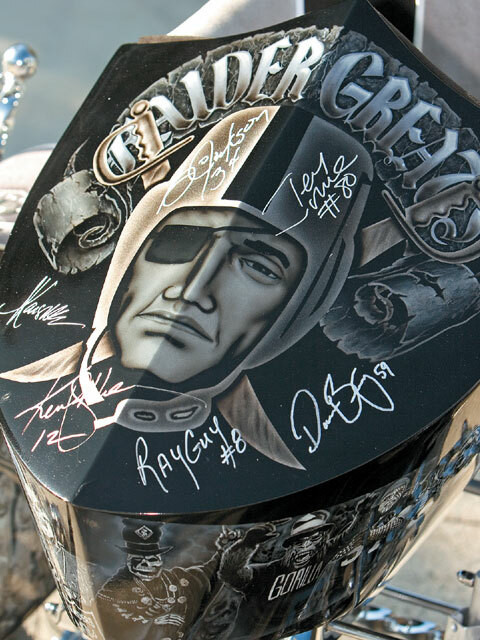 Bo Jackson, Jerry Rice and Ken Stabler are but a few of the Raider greats gracing the bike and sidecar. Yes, we did say sidecar. 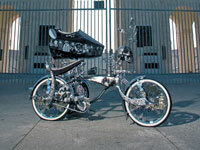 The car was designed by Smiley and built by Danny “Huero” Garcia of Low Down Customs in Lynwood, California. The sidecar, which includes a hydraulic lift, was added to be able to include the greatest fans in the world, members of Raider Nation. It also serves as a Hall of Fame shrine to the greatest Raider players. 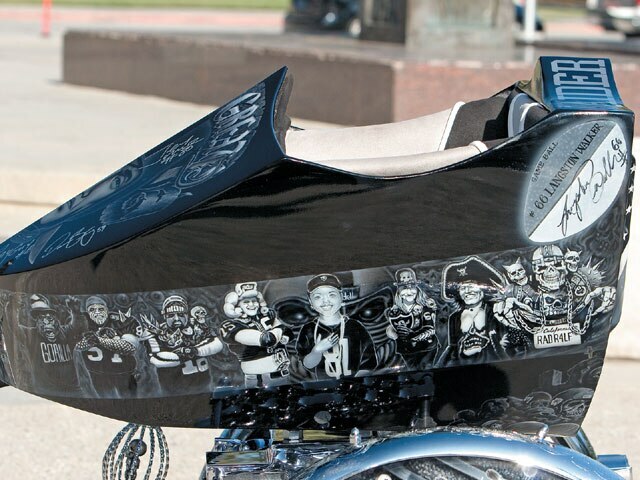 The banner on the top of the sidecar proclaims, “Raider Greats,” and thus far Bo Jackson, Ken Stabler, Jerry Rice and Marcus Allen have added their autographs. Along with some of the characters who make up Raider Nation, the sidecar even has a picture of Lianna wearing a Super Bowl XVIII ring. Nnamdi Asomugha and Langston Walker are Lianna’s favorite current players and the sidecar features game balls signed by both. The sidecar also holds a DVD player and screen in the rear. The work was done by “Mando” at DNA Sounds in Los Alamitos, California. The interior has a leather seat and the number 21, Nnamdi Asomugha’s number. The interior chores were handled by Richard of SoCal Creations. 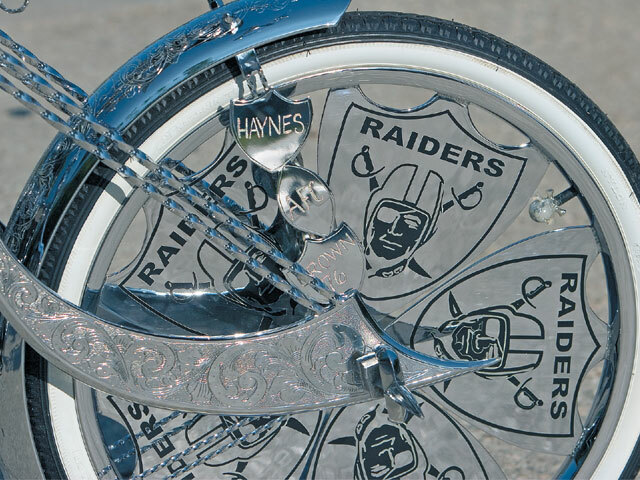 Everyone loves the bike and it always amazes Lianna how even Raider haters have to give the bike props. Over the years, Lianna and her dad have developed a relationship with the Raider organization and this year they were invited to the Raider Nation Celebration. You can believe that there was nothing but love for “Raider Image” in the building that day.